We had blowing dust and we woke up one morning to the smell of fire-a range fire on our western neighbor- the Diamond A Ranch. Lucky for us the Diamond A is pretty big and the fire was maybe 25 miles away. 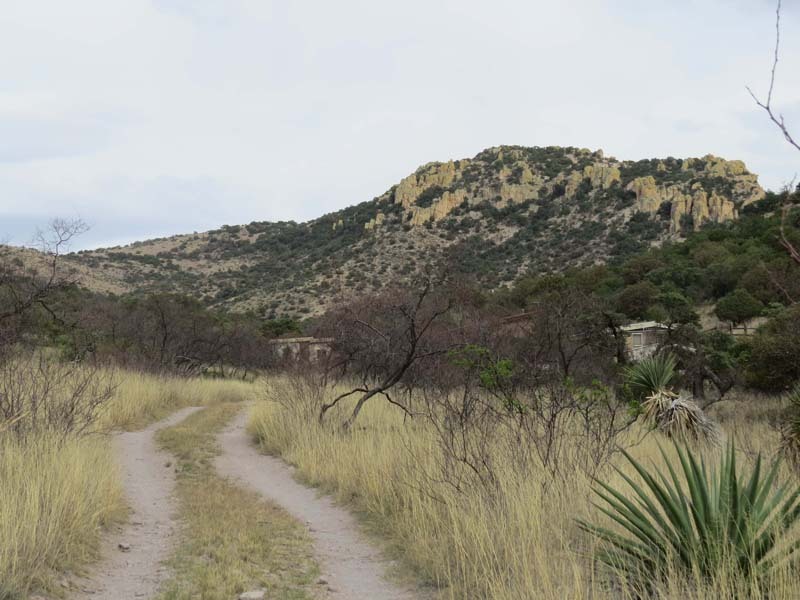 We prayed for rain every day but only got a trace as we drove back over Granite Gap headed for the Tucson Airport. But we had a blast anyway. 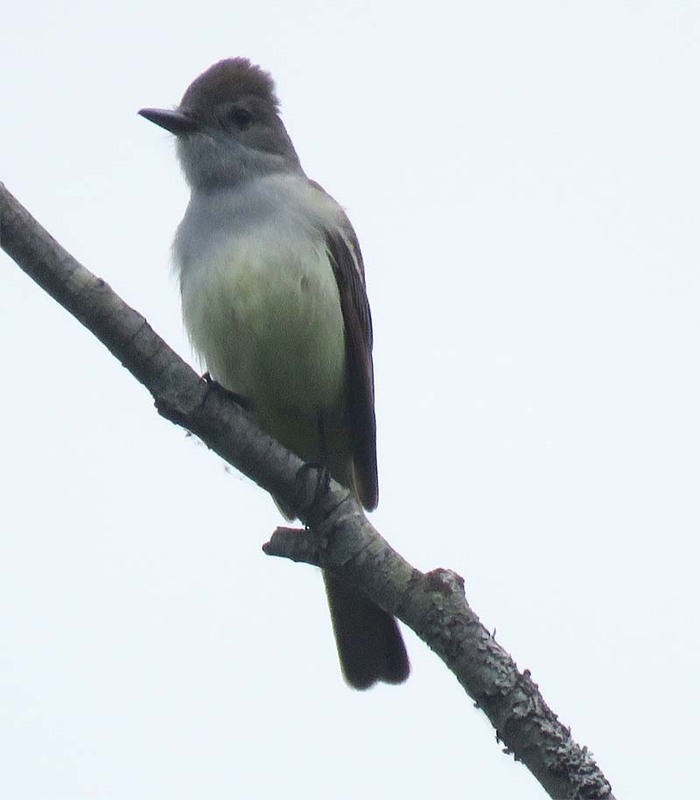 We always stop at the Airport Wash at the Tucson Airport, next to the cell-phone lot, where we found a Black-capped Gnatcatcher, rare in the US though increasing. No pictures, we don’t photograph until we’ve gotten a good look if we’ve never seen the bird before, and then it disappeared into the foliage. 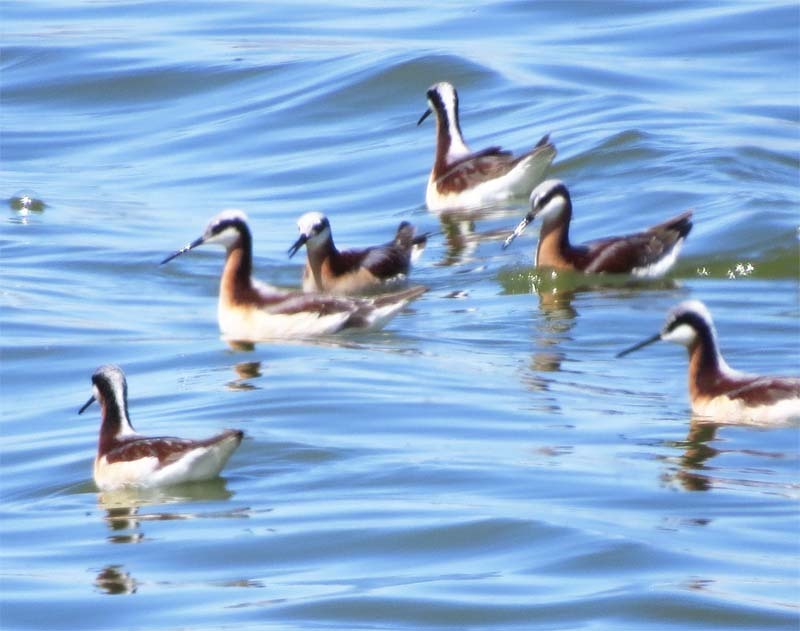 Next stop was Cochise Lake in Willcox where we saw these gorgeous but out of focus breeding-plumaged female Wilson’s Phalaropes with their somewhat duller mates. 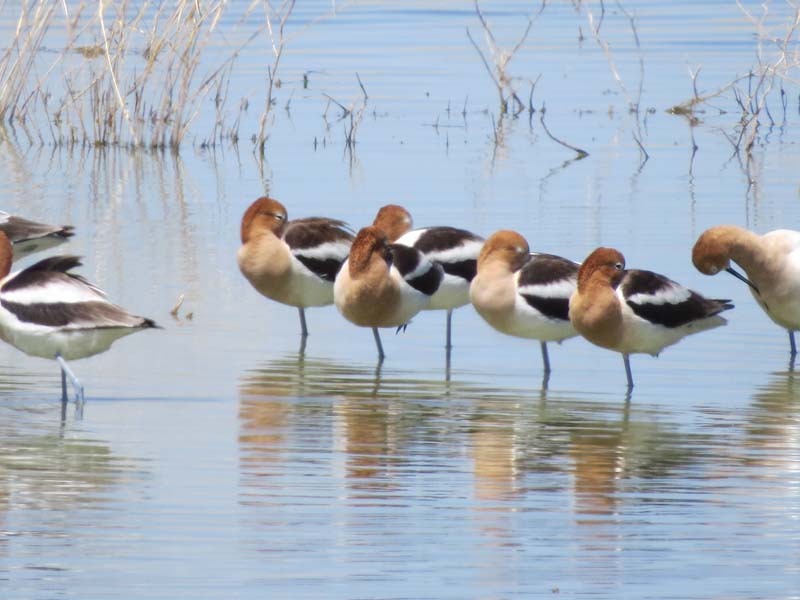 We also had lots of American Avocets. Here is a group engaged in napping. 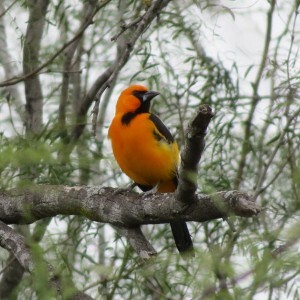 At the ranch we had a pair of Scott’s Orioles coming in in the morning for the Hummingbird feeders. 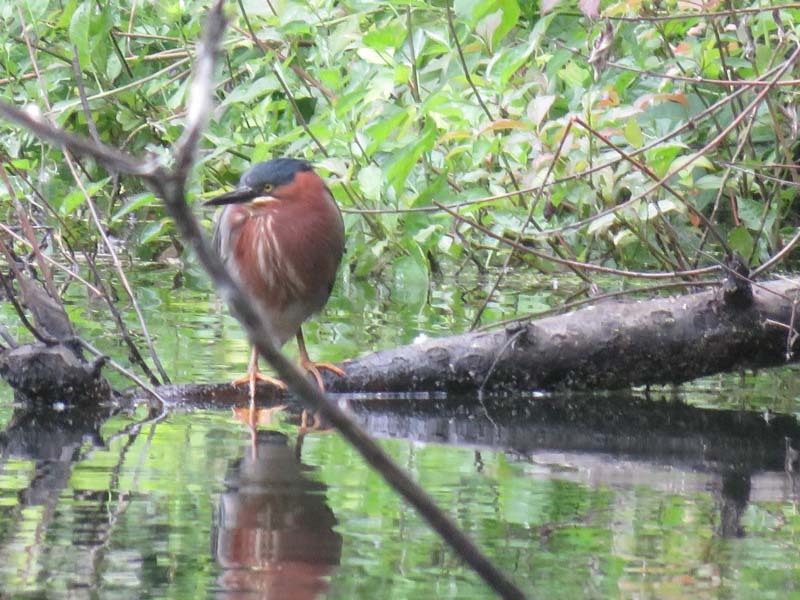 This bird is not only beautiful, in my opinion, it makes the most beautiful sound in America, well, maybe after the Common Loon when that bird forms a Loon-choir in the middle of a BC or Minnesota night. 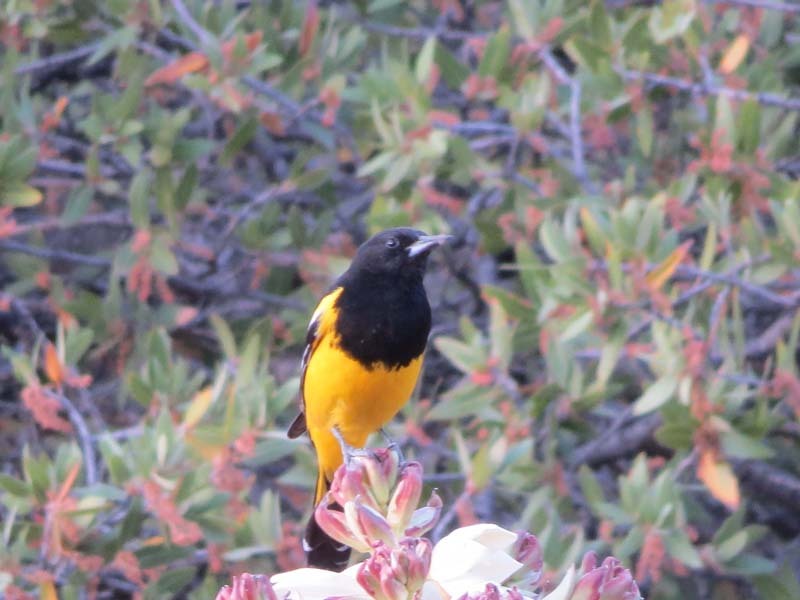 Here is the Hooded Oriole male. Both Orioles are devoted pair-mates. 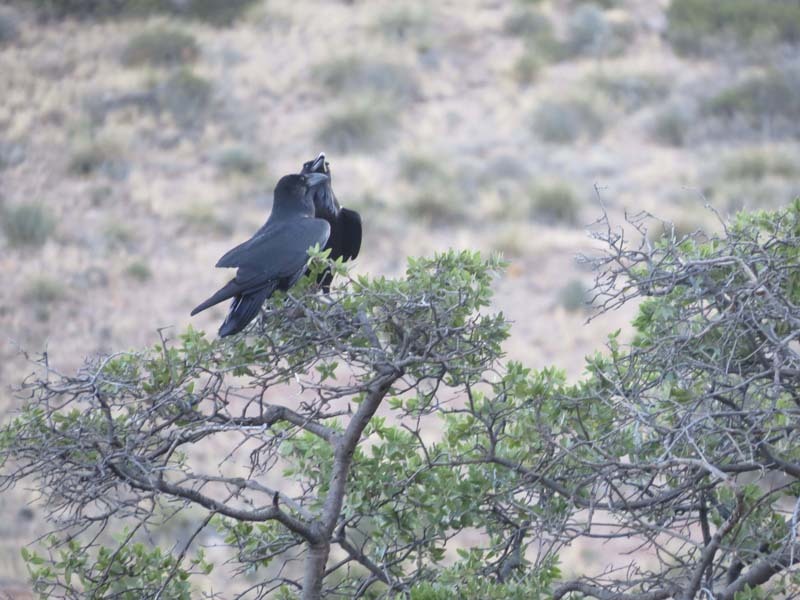 Speaking of which, the Common Ravens this year have given up their fear of us after 40 years and started hanging out across the driveway. They would sit in the oak and kiss, then visit a neighbor couple down at the gate, then come back and smooch some more. 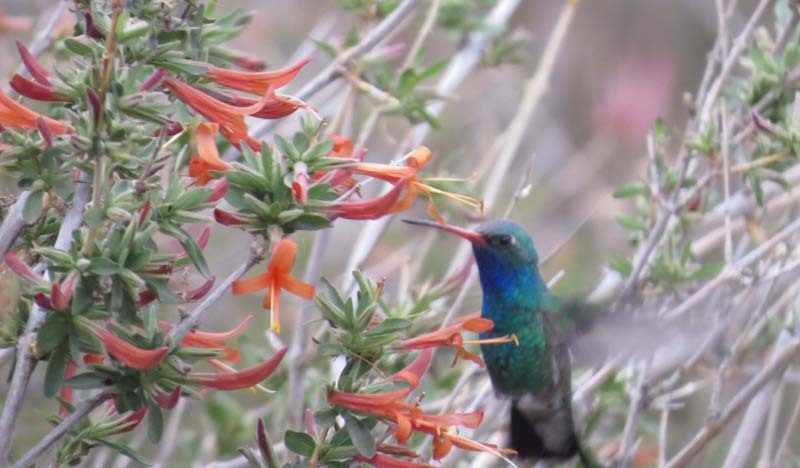 We experienced the “Desert Blues.” One case was this male Broad-billed Hummingbird, showing some spectacular blue while foraging on Desert Honeysuckle. 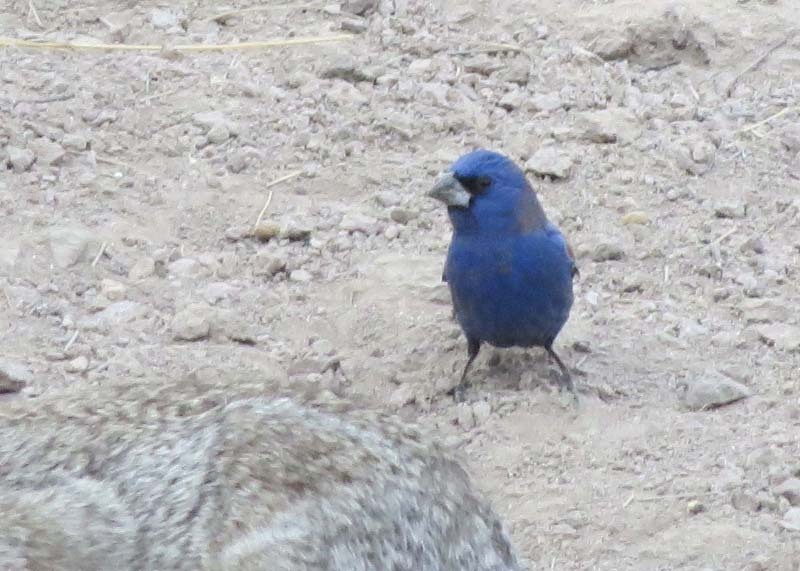 On the last day we were in the bootheel (extreme sw New Mexico) a Blue Grosbeak showed up. 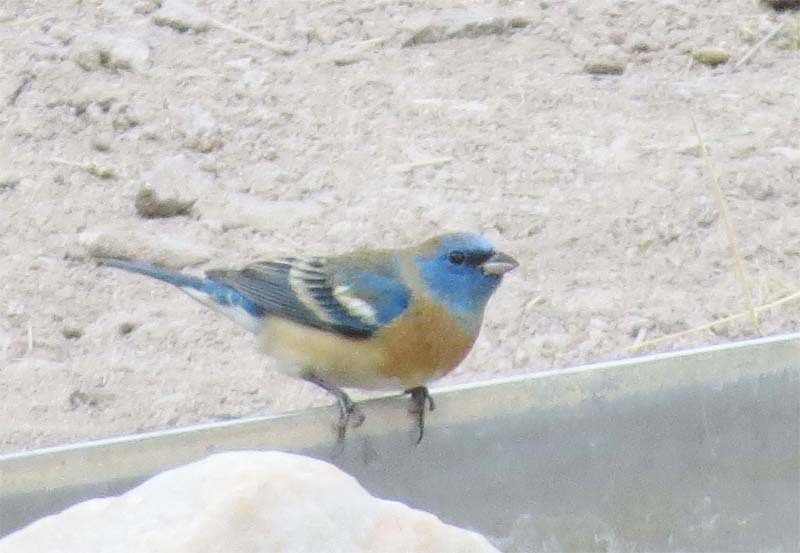 We missed the all-blue Indigo Bunting and this young male Lazuli Bunting was still getting all his blue. 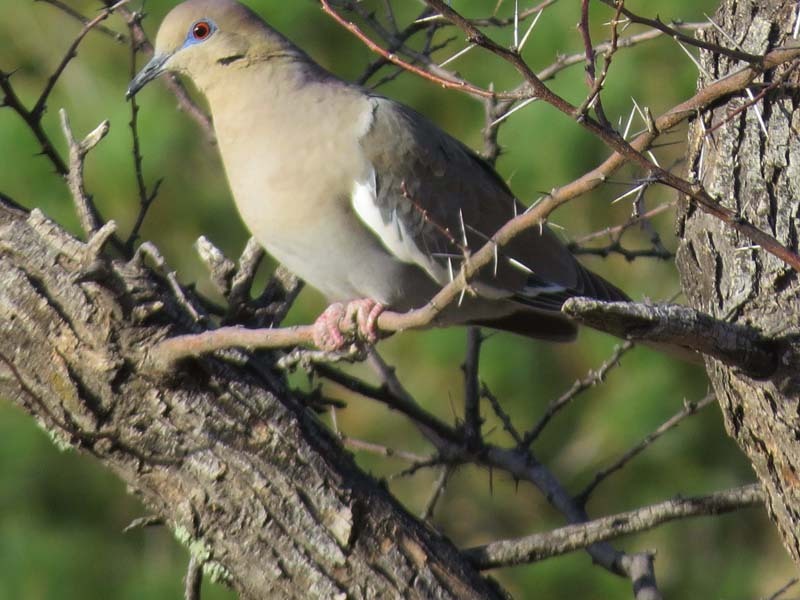 And check out the blue spectacles on this White-winged Dove at the ranch. 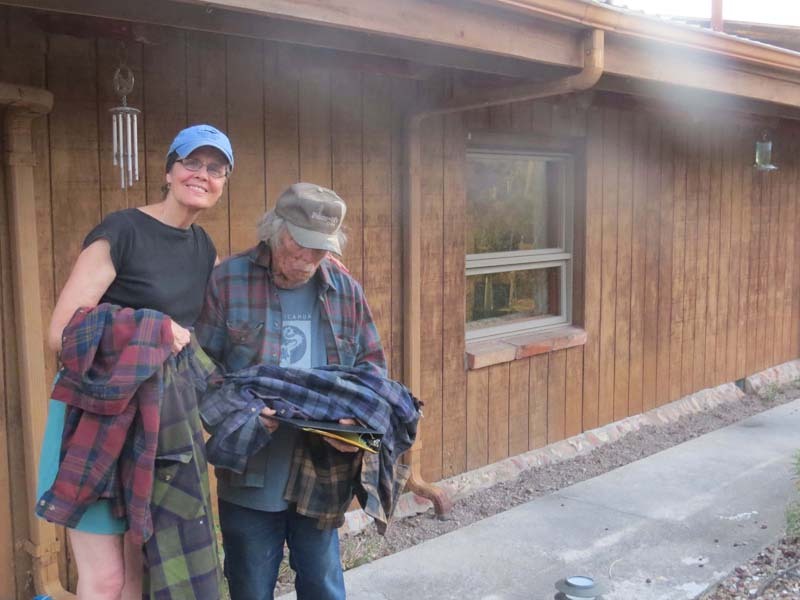 We headed over to Arizona one day and visited Portal, AZ. 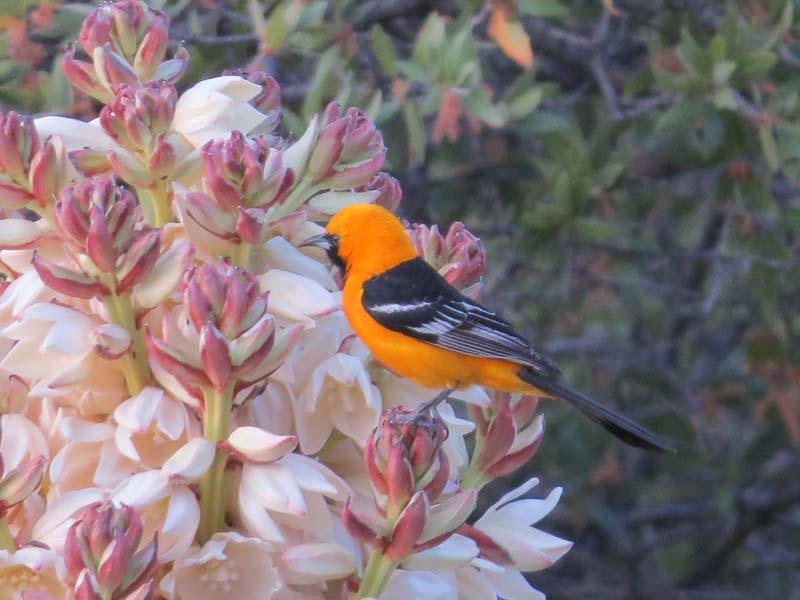 We saw the Lewis’s Woodpecker that’s been hanging out at Cave Creek Ranch and found a Rose-breasted Grosbeak and a pair of Summer Tanagers in town. 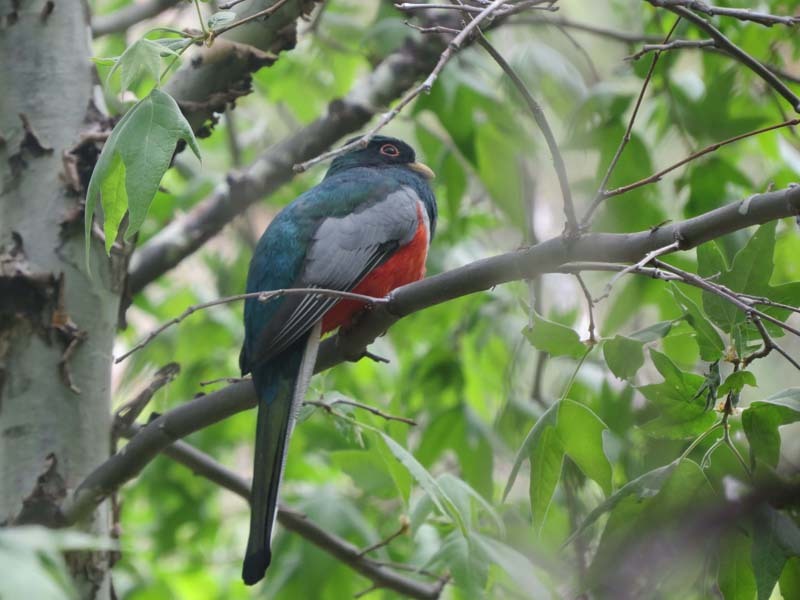 We hiked up Cave Creek and saw a few Elegant Trogons, including this male. Here Delia talks to CD Littlefield. Not only has CD literally written the book on Birds of Malheur, and defended Sandhill Cranes on the national stage, he is also, we have discovered, a truly lousy chef, having invented the “Trapped Butter Sandwich.” When we leave food with CD, we make sure to cook it first. 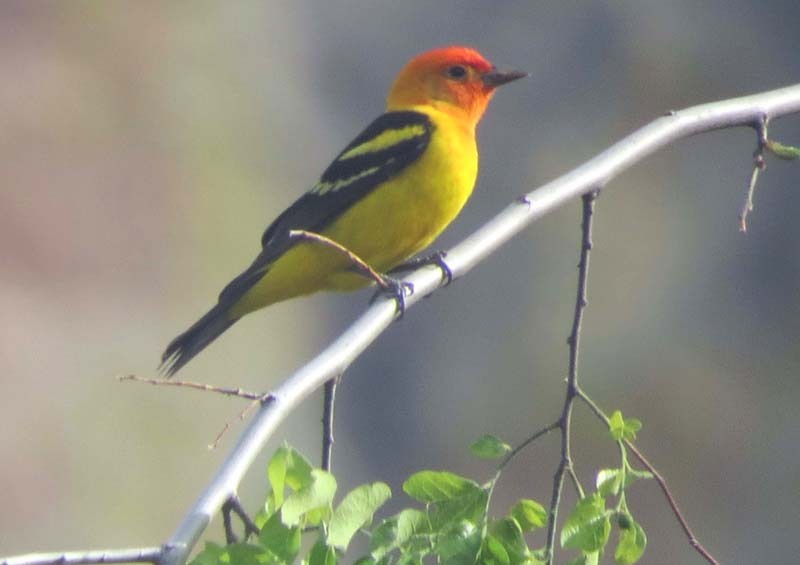 This Western Tanager perched in a tree above our friend Jeannie William’s house in Portal. The moon was full one night. 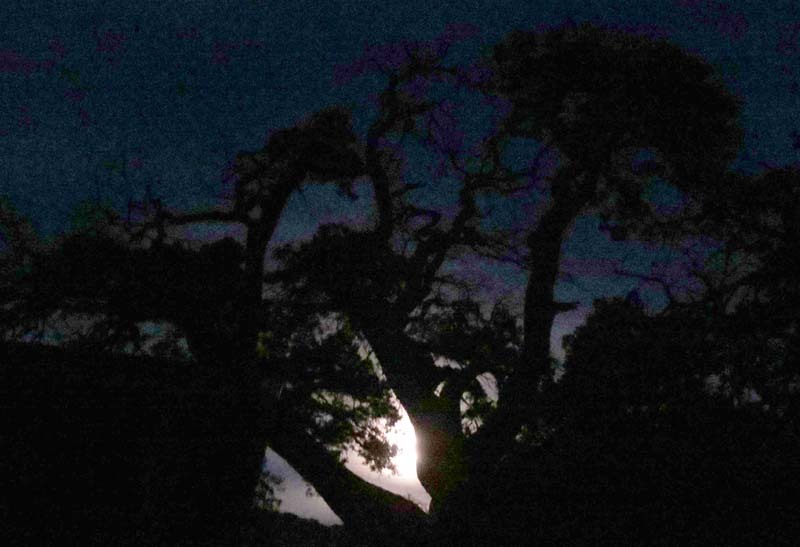 This is how it looked behind our old-growth Alligator Juniper just up-canyon from the house. 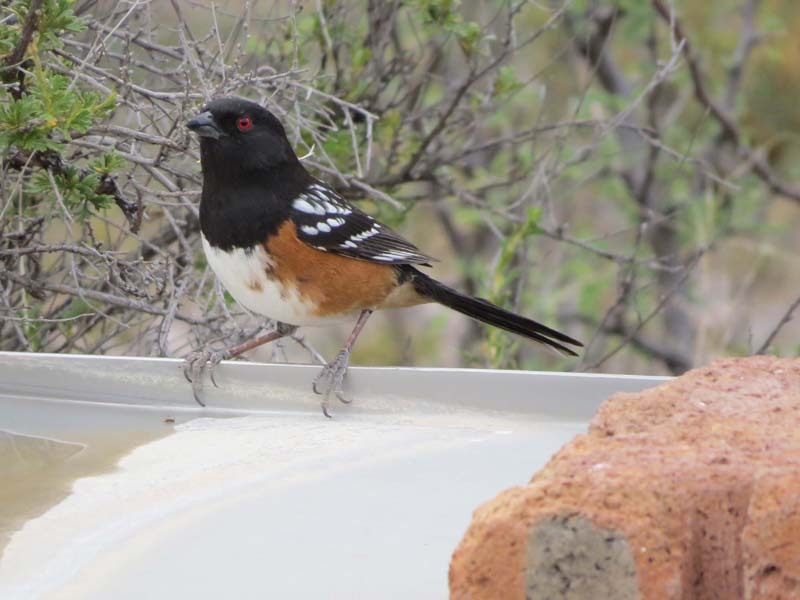 Spotted Towhees are year-round residents in the canyon, one of the most dependable birds there. This one was looking spiffy. 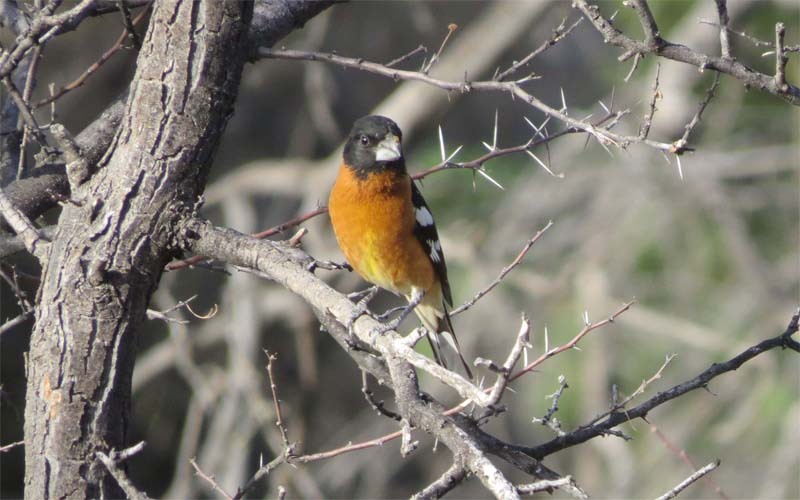 While we were there the Black-headed Grosbeaks showed up in force. 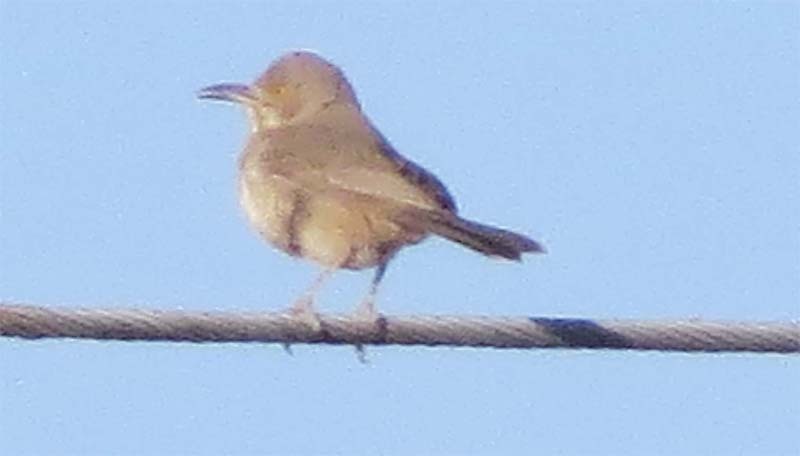 A Bendire’s Thrasher was singing in the San Simon Valley. We have a hard time telling the song apart from a Curve-billed Thrasher, so we take a picture. This shot is from last winter. 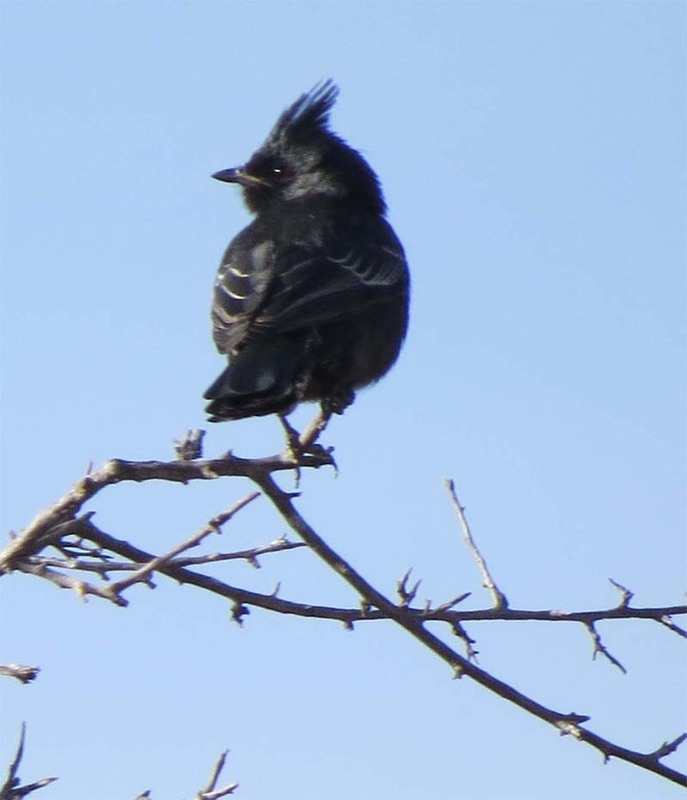 I worry about Phainopeplas. As we sped by on Route 10, one was flying over the San Pedro River (dry) this time. We had 124 species of birds on the trip. 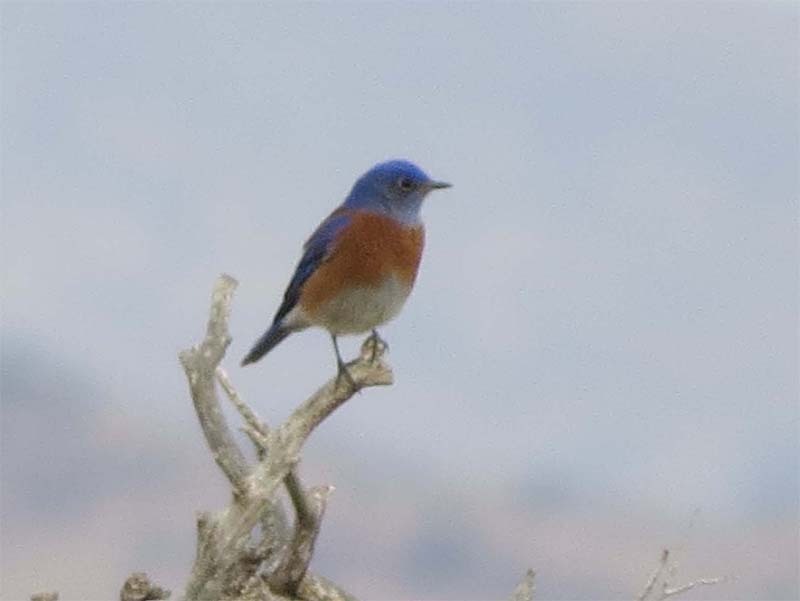 Another shot from last winter, which I just found in my memory card, a Western Bluebird. 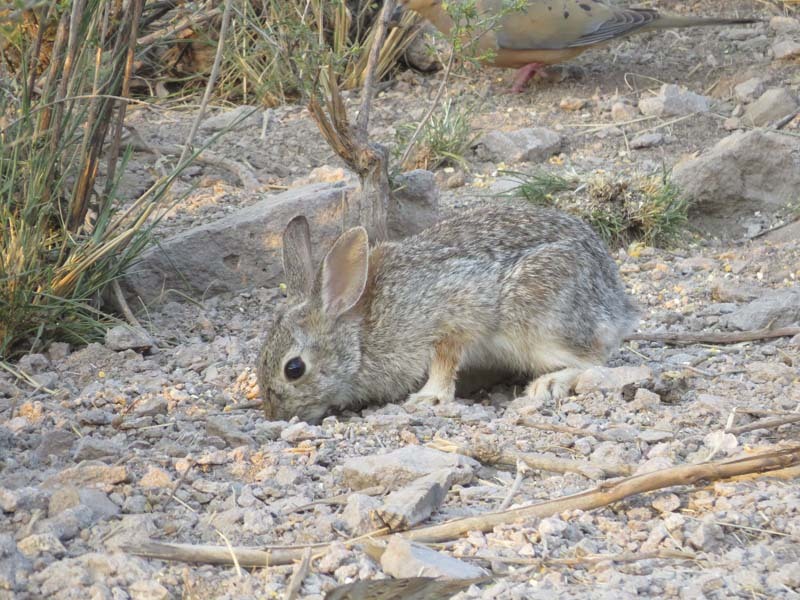 The Cottontails in the canyon always look like they are out of an English children’s book. We hiked to the pass. Looking east from the spine of the Peloncillos, Animas Peak (8500 ft.) is visible to the east. 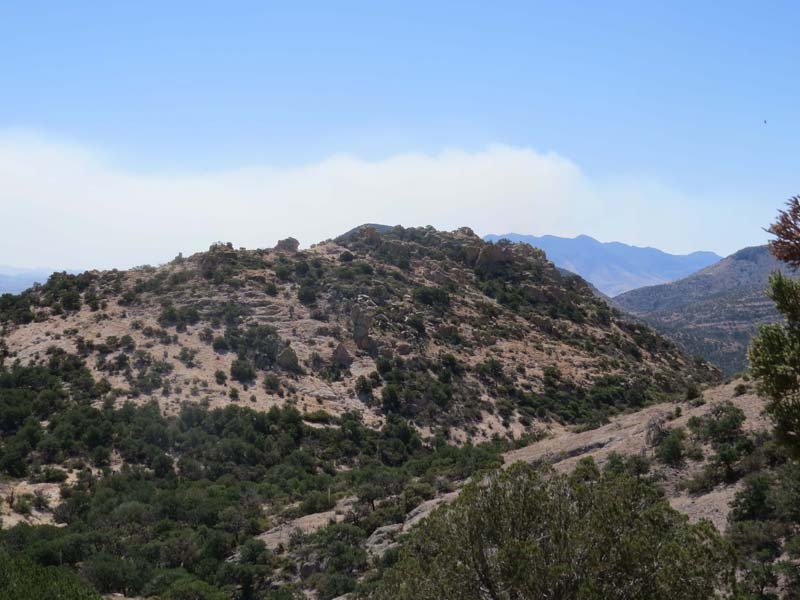 The white is smoke from a fire on the Diamond A Ranch, formerly called the Gray Ranch (1,300,000 acres) which encompasses much of the Animas Mountains. And here are the White Cliffs that dominate the view from the gate and pumphouse. 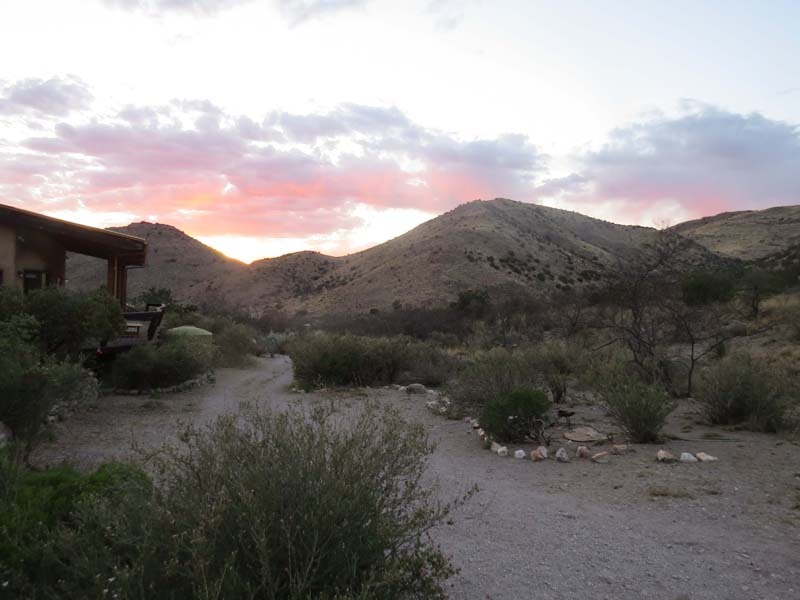 This is looking down canyon as one of our Days of Heaven comes to a close. All manner of horrors are unfolding everywhere, which makes the beauty that is hanging on around us all the more important to cherish. 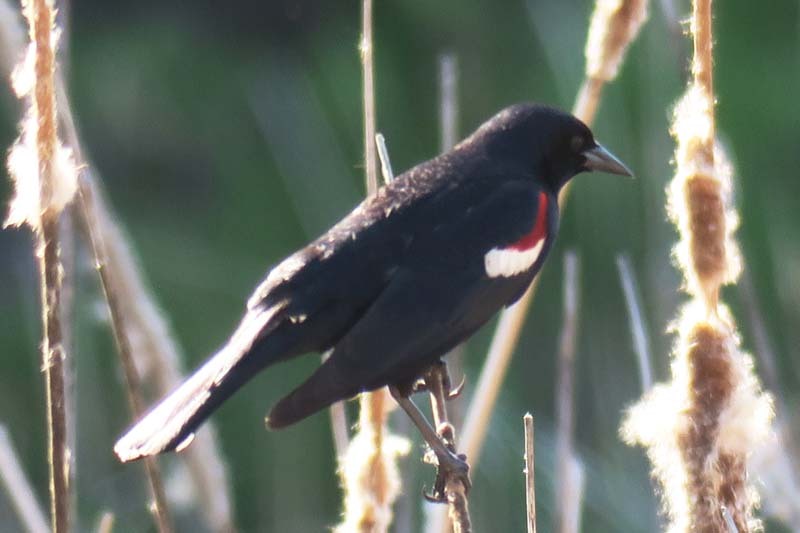 Delia and I went east to Grant County and I saw my first ever Tricolored Blackbird (Delia had already seen it) This is a colony nester, a bird that is in trouble due to intensive agriculture in its native Northern California wetland home area plus of course drought. The colony that we saw at Morgan Lake in the Columbia Wildlife Refuge may be a refugee colony from California, but Delia and I don’t know that definitively. When we visited the glamorous males were no longer making the special effort to display their crimson shoulders, apparently all the pairing up and showing off was over for this year, but you can still see the red. 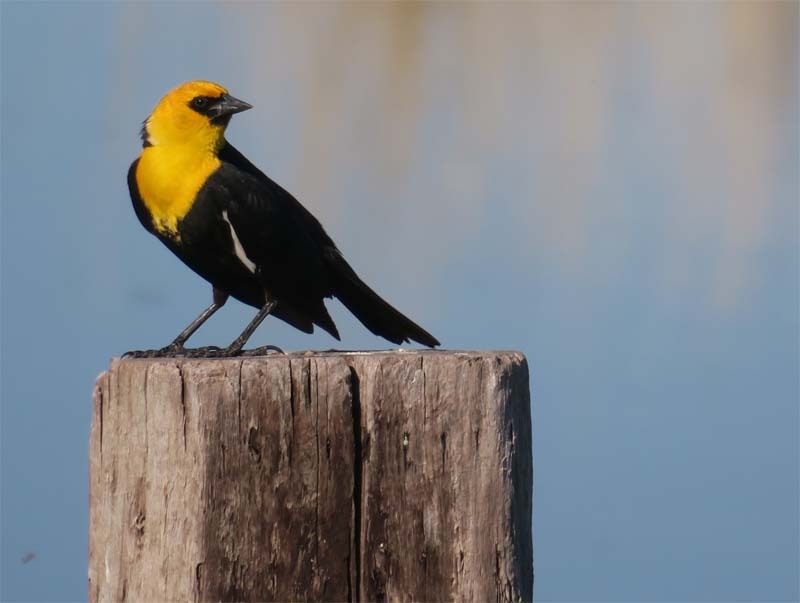 This Yellow-headed Blackbird at nearby Para Ponds posed against the blue sky reflection in the ponds. 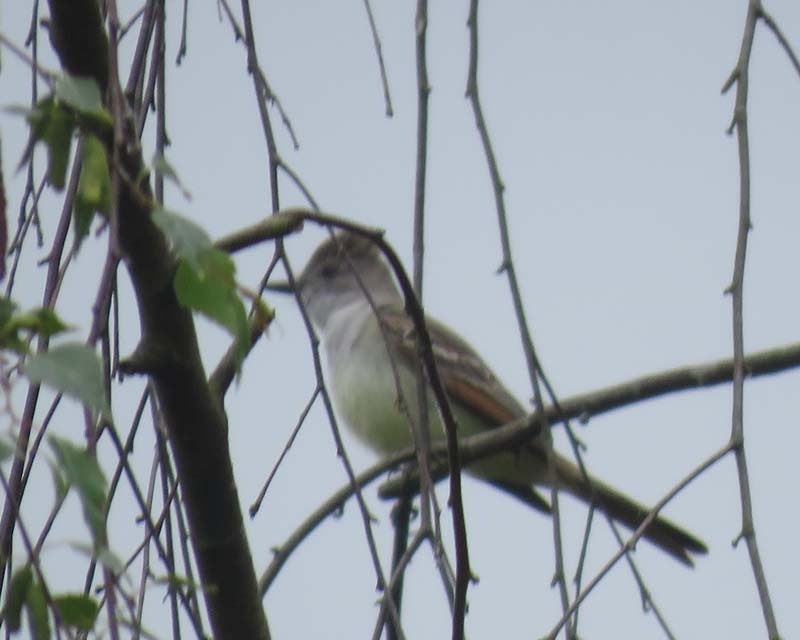 At Lake Sammamish State Park we found this Ash-throated Flycatcher, one of the commonest birds on the ranch down in the bootheel but only a vagrant here, with 20 or 30 sightings ever in King County, based on Delia’s ebird count, a number that is certain to be wrong one way or the other. This shot is not very good but it shows most of the key field marks of the bird, which also has great vocals.